Once it was confirmed yesterday that Jules Bianchi had suffered a diffuse axonal injury as a result of his horrific crash at the Japanese Grand Prix, all sorts of facts and statistics began to be perpetuated by some sections of the media. One such statistic which rankled with me in particular was one that claimed that 90% of people with Jules’ injury never regain full consciousness, and of the remaining 10%, the vast majority of those remain significantly impaired for the rest of their lives. Having little medical knowledge, but having heard of diffuse axonal injuries, particularly with regard to racing drivers, I was immediately sceptical of this fact. One quick Google search confirmed my suspicions. What the 90% statistic quoted by various sources refers to is patients with severe diffuse axonal injuries. That does not cover patients who have suffered minor injuries of this nature, which can include non-life threatening conditions such as concussion. In essence, a fact that is attributed to the very worst case scenario of this condition has been applied it to any case of any possible seriousness. The truth is that no one knows the extent of the DAI that Jules Bianchi has suffered. The only people who know that – and given it’s still very early days even they may be unaware – are Jules’ doctors. Therefore, for stories on the fact that there is a 90% chance that Bianchi will never regain consciousness is incorrect at best, but given the circumstances of the story, sad to say the least. In short, a story involving a man who currently lies in hospital in a critical condition has been needlessly sensationalised, which given the situation is, in my opinion, totally unnecessary. Now, with articles of this nature creating doubts in the minds of fans across the world that Jules may fully recover from his injuries, I seek to use the second half of this post to shed some positivity on what is an extremely difficult situation. The following extract is quoted from Rapid Response: My Inside Story as a Motor Racing Lifesaver, the autobiography of former CART doctor Steve Olvey, and concerns former F1, CART and IndyCar driver Roberto Guerrero. Guerrero suffered an accident whilst tyre testing at the Indianapolis Motor Speedway in the autumn of 1987. Initial scans when the Colombian racer arrived at hospital showed a diffuse axonal injury – the same as Bianchi – and the prognosis initially seemed very bleak. This is where I let Dr. Olvey take over. Apologies for the length of it, but it is such a brilliantly written piece that I felt that to edit it in anyway would be inappropriate. The main message of this story is hope, and although Jules still has an incredibly long road ahead of him, there is no reason to believe that he can’t make it. In the fall of 1987, I was getting a haircut on a beautiful sunny afternoon in Indianapolis. Halfway through I received an emergency page on my beeper. The news wasn’t good. 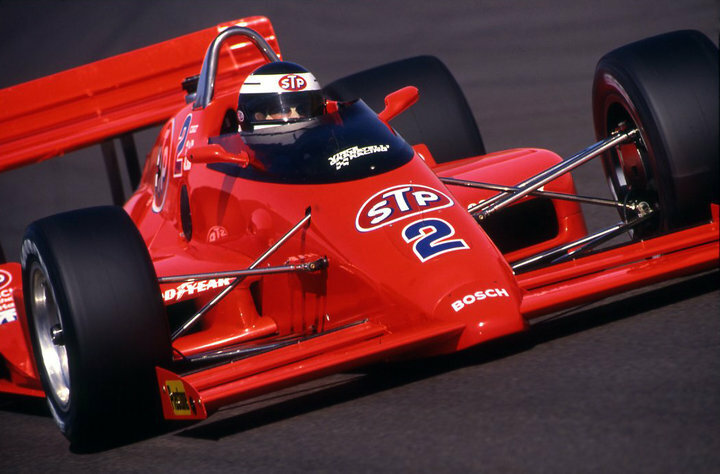 Roberto Guerrero, Colombia’s best driver at the time, had crashed heavily while testing tyres for Goodyear at the Indianapolis Motor Speedway. Medics from the scene had reported a severe head injury with the patient in a deep coma. Guerrero was unable to breathe for himself and required assisted ventilation en route to Methodist Hospital. I jumped from the barber’s chair with only half a haircut and sped to the hospital. When I arrived at the emergency room, I was met by Dr. Bock who was on duty that day. Mike Turner, an excellent neuro-trauma surgeon was on hand as well. They both reported that the head injury looked really bad. The CT scan of Guerrero’s head did not reveal anything that the surgeons could fix. Sadly, it showed instead a very swollen brain with severe diffuse axonal injury, or DAI. Basically, the brain had suffered an extensive shearing injury to the nerve fibres causing the entire central nervous system to short circuit. It could not be surgically repaired. Guerrero was moved from the emergency room to the intensive care unit. The cause of this injury in the general public is usually a car accident. The forces of a crash, if severe enough, cause the head to violently rotate. Severe damage can occur to the brain without the head ever coming into contact with anything. Nerve fibres within the brain and brainstem are damaged by this shearing effect. A helmet offers virtually no protection for this type of injury. The mortality rate in the general population was over 80% in 1987, and the only treatment was, and still is, supportive care. Judicious use of medications to help remove the excess brain water and to control the increased pressure that develops inside the skull are the only modalities of therapy. One promising treatment had recently been tried in some large medical centres with varying degrees of success. It was not yet in common usage, and most neurologists and neurosurgeons did not feel it was beneficial and were reluctant to try it. The treatment involved the use of barbiturates in very high, even toxic doses, and were given intravenously. The medication was thought to decrease the metabolism of the brain and, as a result, lower the pressure within the brain itself. If the brain was allowed to swell too much, it would herniate or rupture through the opening in the base of the skull. This extrusion of the brain stem would normally result in instant death. We had used barbiturates to treat increased brain swelling in the past, but only in the standard recommended doses. We had never used the very high experimental doses that had been reported in the medical literature. Dr. Turner and I met with Guerrero’s wife Kati and explained to her the gravity of the situation. We told her there wasn’t anything we could do surgically and that the only hope for her husband was supportive care and the use of high dose barbiturate therapy. We asked for permission to use these very high doses. Kati grasped the situation fully and told us to do anything we thought might save her husband’s life. Dr. Turner and I placed Guerrero in an artificial coma with the barbiturates. He required the ventilator for breathing support and constant monitoring of his vital signs, and a probe was placed inside his brain to measure his intracranial pressure. It was sky high! Normal was less than 15. His was over 60. I started pushing the barbiturates intravenously. We reached the usual maximum dose with zero effect on the pressure inside his head. The situation looked grim. I then gave him five times the recommended dose. This caused his blood pressure to drop to near zero. I thought he was dying. I quickly started another medication to raise his blood pressure, and he required huge amounts of this medicine. I was not at all hopeful. Kati remained by his bedside, determined. After about seven hours of this treatment, and a lot of criticism including accusations of experimentation amongst the nursing stuff, the pressure within Guerrero’s brain began to subside. Within 24 hours it was back to normal. He woke up three weeks later. I had spent most of the first 36 hours at his bedside. His wife never left him at all! She remained by his side throughout his entire stay in the intensive care unit. She would later accompany him daily through the long rehabilitation process. When Guerrero first spoke, he spoke in Spanish, his native language. He told Kati that he loved her. He steadily progressed, and eventually was ready for a long and difficult rehabilitation. Spurred on by Kati and his young son Marco, he took this rehabilitation to heart. He was one of the first patients to receive what we call cognitive rehabilitation. This form of rehab used computer-assisted exercises to bring a person’s memory and visual motor skills back to baseline via biofeedback. It was very much like playing a series of complicated video games. Guerrero was scheduled spend five hours a day doing these exercises. He would spend nine. During this period he would also re-learn to walk and to speak the English language. Kati was unrelenting, pushing hard. As a result of her efforts, her determination, and her deep affection, Guerrero was driving the family car within two months and had played a full game of golf in three. His recovery surprised all of us. In April of 1988, he wanted to drive a racecar again. His team entered him in the race at Phoenix. I thought he could do it as well because he appeared to me to be fully recovered. No-one else seemed to think so. Due to justifiable apprehension on the part of the CART officials, as well as his fellow drivers, doctors subjected him to a full nine-hour battery of neuro-psychiatric tests. He passed them all with flying colours. I repeated the tests for a second time at the University of California in Los Angeles just to assure the officials that they weren’t biased. Again he passed! At UCLA, he was consistently monitored for any seizure activity. He had none. He was then required to go through a strict driving test under the eyes of the CART Chief Steward Wally Dallenbach. Again he passed! CART had no choice but to clear him to race. Guerrero qualified second in a field of 28 cars. Some of the other drivers would barely speak to me. The only two people, other than Roberto, who were convinced he could drive were Kati and me. Once the race started I could barely function. All I could think was what if he crashed and hurt or killed himself or someone else? I would never be forgiven in spite of all the precautions I had taken. After the start, Guerrero held onto second place. He began passing lapped cars as if possessed. He passed on the outside as well as the inside. Phoenix is a one-mile oval track with each lap taking 25 seconds. Negotiating heavy traffic on such a tight course was what made the short ovals so spectacular to watch. Roberto was awesome! He would finish second that day less than six months after his devastating and usually fatal head injury. I was vindicated on all counts. Because of my experience with him, head injury became my primary focus of study. Guerrero went on to race for many more years. He and Kati are still married and live in California with their two boys. It is amazing what persistence, love and dedication can accomplish. Also, a certain degree of really good luck! ← Recriminations can wait. Bianchi’s health is the only thing that matters. Thanks for the info, and the long quote. Wow!. Wonders never cease! Our thoughts are with Jules. On January 7th 2014 I came off my motorcycle and suffered a diffuse axonal injury. Its been about 11 months now and my wife was told i would probably be a vegetable for life. The recovery is taking seemingly forever. I also have a diffuse axonal injury so my left arm doesn’t work. I spent until late May in rehab and I’ve been home for 6 months now. I feel like 100% is within reach. Im learning to run and jump again. Times have never been harder but reading stories like this really are inspirational.